In 1970, John Wayne earned an Academy Award® for his larger-than-life performance as the drunken, uncouth and totally fearless one-eyed U.S. Marshal, Rooster Cogburn. The cantankerous Rooster is hired by a headstrong young girl (Kim Darby) to find the man who murdered her father and fled with the family savings. When Cogburn's employer insists on accompanying the old gunfighter, sparks fly. And the situation goes from troubled to disasterous when the inexperineced but enthusiastic Texas Ranger (Glen Campbell) joins the party. Laughter and tears punctuate the wild action in this extraordinary Western which features performances by Robert Duvall and Strother Martin. 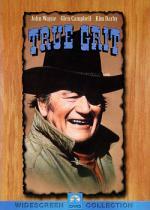 After seeing and enjoying the new version of True Grit, I ended up watching this version. I actually watched it right after I got home from seeing the 2010 version. So of course that one was still very fresh in my mind when I watched this one. The differences stood out to me clearly. I did like this version too, though I think I like the 2010 version a little more. The plot is the same. There were less surprises for me since I watched it after the newer version, but the movie was still very entertaining. The plot works well. The characters are still very entertaining and interesting, though I definitely like Mattie in the 2010 version more. I think I like Jeff Bridges as Rooster slightly more...not that John Wayne was bad in the part..I just think I liked Bridges a little more. Even though both movies have the same plot, somehow this one seems a bit more light hearted. This version isn't as bleak at times. While I still like this version, I think the bleaker look and feel of the 2010 version works for the story a little better. Overall I really like this movie too, though like I said, I think I like the 2010 slightly better.